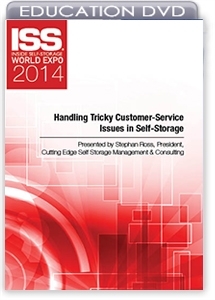 Learn how to effectively address difficult customer-service situations in self-storage, including procedures to put in place, how to initiate contact and how to close an interaction once resolution is reached. Great customer service drives loyalty and retention in self-storage and is one of the easiest ways to differentiate yourself from competitors. The person who interacts with tenants and prospects on the phone, in person and online must be trained in service techniques as part of day-to-day business operation. But what does that person do when service gets a little complicated? For example, how do you handle an upset, angry or unstable customer? What happens when a customer has unique requests or needs? Our presenter will address some of the more difficult service situations facility operators today and how to handle them with aplomb.